On Sunday I had the opportunity to take a zero gravity flight … experiencing zero gravity in the same way NASA trains its astronauts. it was awesome. 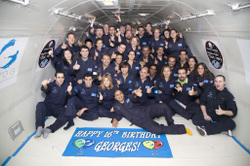 My friend Georges Harik bid on a zero gravity flight to support the X Prize and he invited 30 friends and family members to join him on the ride of our lives. The flight gave us 15 experiences of about 30 seconds each … 1 simulating Mars (about 1/3 Gs), 2 simulating the moon (about 1/6 Gs), and 12 simulating space (zero Gs). I was able to do things I always wanted to (fly like superman, dunk like michael jordan, and levitate at will). it was a really amazing experience. Also — the folks at Zero G are amazing. The really put together an incredible experience that i will always remember. 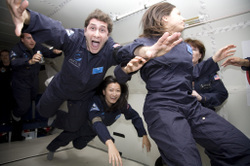 Check out all the weightlessness photos including James Hong doing some killer moves. This entry was posted in Friends on September 4, 2007 by auren.